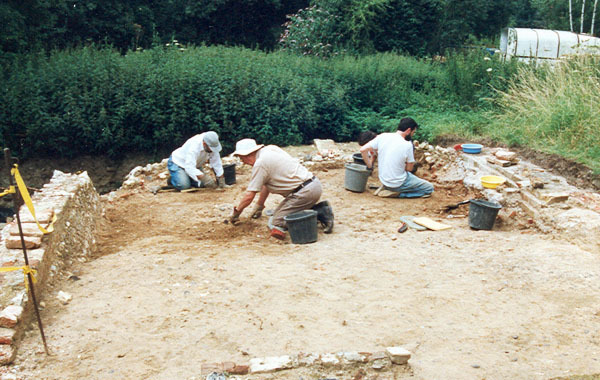 While excavating the foundations of the old outer gatehouse at Scadbury in June 1998, we found a squared block of oolitic limestone among a brick rubble layer of builders’ infill, which can be dated to around 1550. Measuring some six by four by four inches, it is evidently the main part of a larger block which has been broken. The perfectly smooth top surface is engraved with the markings of a sundial. On examination, it is clear that the work of engraving was left unfinished. Thus there are no morning hour numerals before VIII, and this numeral is only partly engraved. There are no afternoon numerals after IIII. Normally, a sundial would be engraved from about 4 or 5 a.m. to about 7 or 8 p.m. The hour lines are present from 7 a.m. to 5 p.m. They are lightly but finely engraved and would have needed to be emphasised in some way before use. In addition to the hour lines, there are also four lightly scribed arcs of circles of radii 3, 21/2 and 2 inches exactly, and 11/16 inches. 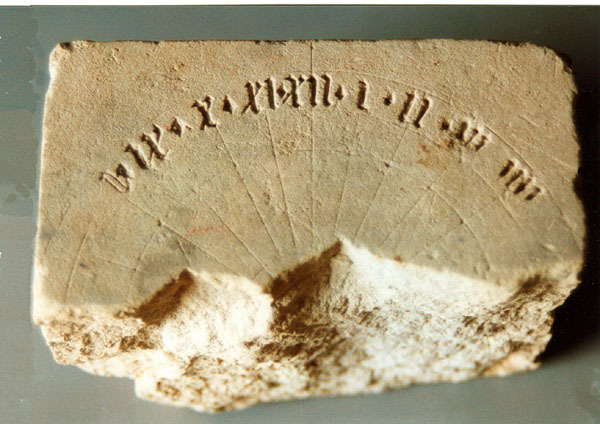 Why is this find of a damaged unfinished sundial so interesting? Considerable mathematical knowledge is needed to place the hour lines at the correct angles so that the (almost) correct time would be shown throughout the year at the latitude of use. The first man in England to do this was Nicolaus Kratzer who arrived in this country in 1517 or 1518. Kratzer , who became horologer to Henry VIII, made a number of dials, including at least two formerly at Oxford (now lost), and possibly designed the still existing astronomical clock at Hampton Court. He died soon after 1550. Thus the Scadbury sundial is a very rare survivor from this early period. It is of course quite unknown whether it was in any way connected with Kratzer himself, but that is clearly a possibility. Scadbury at that time was under Sir Edmund Walsingham, whose position as Lieutenant of the Tower of London put him in close touch with the King and the Court circle. Kratzer was a close friend of Hans Holbein, who painted Kratzer with a sundial and whose portraits of the court circle are well known, as is his painting The Ambassadors (1533) which shows a detailed sundial and other astronomical instruments. The gatehouse excavation produced a number of intereting finds in addition to the sundial. Among these is a pentagonal lead weight correct for one troy pound (equals 12 fine or troy ounces; the troy scale is still in use for precious metals). A troy pound weight from this period must be exceedingly rare, possibly unique. This weight is probably just as important as the sundial, but so far has had little publicity. D. Hawker, The Scadbury Horizontal Stone Sundial, Bulletin of the British Sundial Society, 2013, 25(iv), 28-31. See also our Scadbury Publications Page which has more information in Part 4 of the excavation report.